Causes of Skiers' Toenails Turning Black | Podiatry Associates, P.C. Few things feel more satisfying and relieving than taking off skiing boots after a long day on the slopes. Feet feel so free when you can finally wiggle them again outside your stiff boots. It’s not so satisfying, though, to pull off your boots and discover that you now have black toenails. Sometimes called skier’s toe, black nails from ski boots are more common than you might think. Toenails turn black when they are injured and your digit starts to bleed under the hard keratin. The blood stains the underside of your toenail a dark color that typically looks brown or black when it dries. Although this looks unsightly, it’s rarely serious and may not even cause pain. Occasionally the blood pools under your nail, creating a little pocket of fluid. This can put pressure on your toe, which is painful and often needs to be released. This happens to skiers because of their boots. 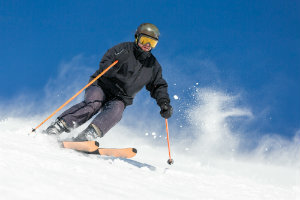 Ski boots are designed to hold a foot firmly in place and support you on the slopes. The have stiff shells and warm padding. Banging your toes against the insides of these boots can jam the nails and damage your digits, creating black toenails. This is most common when your boots are too small or too loose. Boots that are too small pinch the ends of your toes. Boots that are too big allow your feet to slide forward just enough to bash your toes against the front of the stiff shells. Even the thick padding may not protect your toes and nails if your ski boots are not the right fit. Once you have skier’s toe, all you can do is wait for the dark discoloration to grow out, or have painfully pooled blood drained from under your nail. It’s much better for your digits to prevent the problem from developing in the first place by properly trimming your toenails and making sure your ski boots fit correctly. If you’re struggling with painful nail problems of any kind, or are concerned about black toenails that might not be from your ski boots, let our team at Podiatry Associates check it out. You can make an appointment at our Castle Pines, Cherry Creek, and Parker, CO, offices by calling (303) 805-5156. You can also use our website to reach us.